Today’s post was written by Julia White, general manager of Office 365 Technical Product Management. We launched Microsoft Office 365 with the vision of helping people get more done, collaborate more effectively, and have greater flexibility in how they work. As we work, share and connect with others—discovering the right information at the right time becomes even more valuable. To this end, I’m excited to announce a significant step forward in making Office 365 even more personalized and tailored to each person. Starting today, Office Delve (previously codenamed “Oslo”) will begin rolling out to Office 365 business customers. All of this is presented in a beautiful, card-based design that is easy to understand and use. It also presents intuitive ways to view content, so you no longer have to remember where stuff is stored or who shared it with you. And, of course, Delve only enables you to view content you have access and permission to view—we always respect permissions across all parts of Office 365. Delve knows what’s relevant to you based on insights delivered through Office Graph, which uses sophisticated machine learning techniques to map the relationships between people, content, and activity that occurs across Office 365. Delve is the first of many experiences we will release, tapping into the connections and insights from Office Graph. Office Graph currently incorporates content and signals from email, OneDrive for Business, SharePoint Online and Yammer. Over the coming months we will continue to integrate signals and content sources, such as email attachments, OneNote and Lync. 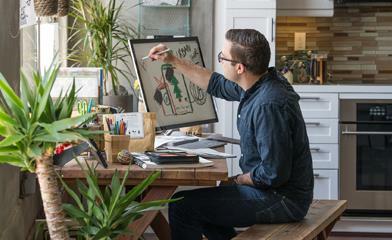 Take a look at this video to see how Office Graph works behind the scenes to power a new set of experiences. Delve simply makes work more intuitive and easier to navigate. 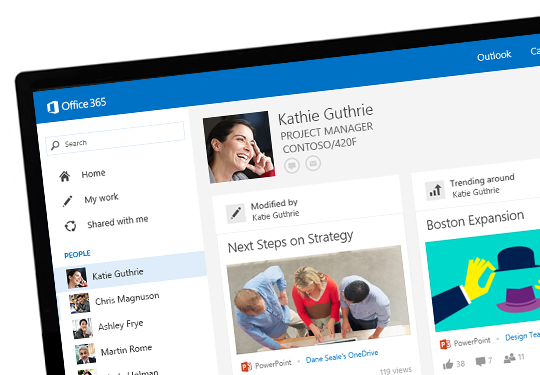 Instead of having to dig through email, search on Yammer, or explore SharePoint and OneDrive for Business to find the right stuff, you can simply use Delve to have the right information delivered to you. On Wednesday, September 10th, the Office 365 Technical Network will host a Delve YamJam from 9:00 – 10:00 a.m. PDT / 4:00 – 5:00 p.m. UTC to discuss these Delve and Office Graph announcements. For those unfamiliar with a YamJam, it is similar to a “TweetJam” on Twitter or an “Ask Me Anything (AMA)” on Reddit, except it takes place on Yammer. A YamJam provides the opportunity for the community to ask questions and have a discussion with a panel of Microsoft experts on a particular topic. Q. Which Office 365 plans include Delve? A. Delve is included in the Office 365 Enterprise E1 – E4 subscription plans (including the corresponding A2 – A4 and G1 – G4 plans for Academic and Government customers respectively). Starting in January 2015, Delve will also be included in the Office 365 Business Essentials and Business Premium plans, Office 365 Small Business, Small Business Premium and Midsize Business plans. Delve will be rolled out to all customers that have one of the above subscriptions, both new and existing. Q. Is there a way for customers to see Delve sooner? A. Yes, Office 365 administrators can opt-in to receive significant service updates upon first release rather than standard release by logging into Office 365 and adjusting their service settings. More information is available here.